How can Daruma meditate in peace with a moskito hovering around? 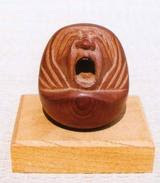 Daruma with the pestering mosquito (moskito) has been the subject of many Kutani pottery pieces. Nr. 49, 52, 56, 57 and more. If anyone can offer an explanation about Daruma and the moskito, I would be much obliged.
. mosquito, ka 蚊 - the KIGO .
. KOAN and HAIKU .